I must admit that thyme is one of my favorite culinary and ornamental herbs. I grow every variety I can get my hands on. Lemon thyme, silver thyme, common thyme, and creeping thyme; the list goes on and on. Wooly and creeping thymes are great for ground covers to walk on, emitting their earthy aroma with every step. These thymes are well behaved for ground cover and never behave as thugs in my garden. 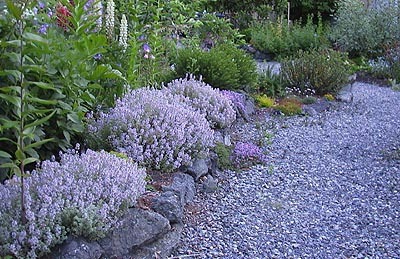 Thyme can be grown as small bushy shrubs, carpet-forming herbs or as a colorful ground cover between stepping-stones. With wiry stems and tough leaves, thyme can be used in a variety of ways. A native of hot dry hillsides, thyme needs at least a half day of full sun and well-drained soil, but will adapt to different growing conditions. I like to place it in raised beds to provide the best drainage. During exceptionally wet winters, lemon thyme will sometimes die. 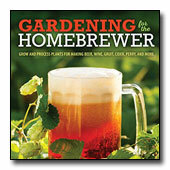 Several methods to propagating these herbs provide more plants. Divide in spring or take cuttings are favored ways to propagate. You can also propagate thymes by layering. Take a branch and bend it to the ground, anchoring away from the branch tip with a rock or a bent wire. Pile soil over the area of the plant you anchored to the ground. After roots have formed, cut branch away from parent plant and move to desirable location. If the center of the plant dies back, pile soil over the center and the plant will regenerate. After planting thyme and while they establish themselves, keep well watered. Once established, thyme is drought tolerant, and thrives in our Mediterranean-like climate. 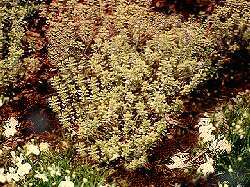 Lemon thyme with its yellow and green colored leaves adds a fine texture to the garden. Nestled in with perennials and edible plants and standing 6-9 inches tall, it adds lighter foliage to the garden. A strong lemon scent makes it good ingredient to add to fish, stuffing and vegetables. 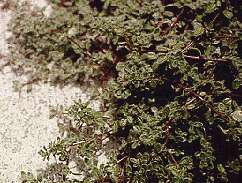 Common thyme is the most frequently cultivated and used for culinary purposes. Its flowers are white and have an upright growth, 6 to 9 inches in height and spreads 4 to 6 inches. 'Argenteus', a silver edged thyme, is evergreen during our winters. In summer, the flowers bloom pink. It stands ten inches high with a spread of 18 inches, making it a good choice as an edging plant. 'Silver Posie', with silver-white variegated leaves and mauve pink flowers, stands ten inches high by 18 inches wide, making this another good choice as an edger. Wooly thyme is one of my favorite aromatic ground covers with its pale gray-green foliage that is soft to the touch. A splattering of pale pink flowers is occasionally found on this 1 to 3 inch high plant, spreading outward to 3 feet. Leaves may used for culinary purposes. I have this spilling over a rock wall under a plum tree and I enjoy the effect. Creeping thyme covers the ground like a carpet. I love breathing in the aroma it puts out when tread upon. 'Annie Hall' has pale pink flowers with height ranging from 1/2 inch to 3 inches tall and spreads about 3 feet. Easy to start from seed and once established easy to divide and plant elsewhere to increase your ground covers. T. serpyllum 'Elfin' has tight growing foliage and grows 1/2 inch high. This one is perfect between stepping-stones where a very low growing growth is wanted. Thyme is a very versatile herb. It goes well with just about anything such as beef, lamb, poultry and even fish. It’s used extensively to flavor soup stocks and casseroles. It‘s also great added to herb butters, vinegars, stews, and sauces. My mouth is salivating just thinking about it. Prepare beans for cooking. Boil or steam for 10 minutes or until tender, and drain. In frying pan heat oil on medium heat. Sauté slivers until slightly brown remove slivers and raise heat to medium high. Stir in the beans and garlic in pan, stirring until garlic turns to brown, mix in nuts and thyme. Remove from heat and serve.